ILUT | What Does ILUT Mean? 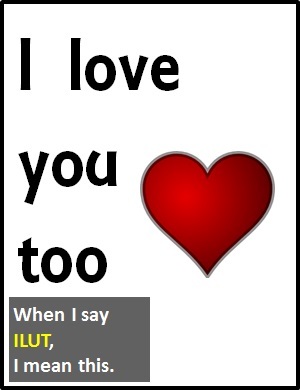 ILUT (I Love You Too) is a response to a declaration of love. Son: You can't say 143, dad. That's for young people. ILUT. Person A: See you tomorrow, darling. LU. ILUT is used as a standalone declarative sentence (i.e., a statement). Of note, ILUT is classified as a cyber term. It is not an initialism abbreviation or an acronym because the "U" is not the initial letter of "you". Before the digital era, we would have just said "I love you too" instead of ILUT.